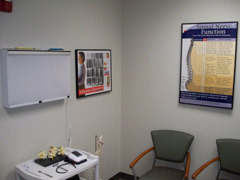 The second visit will consist of Dr. Floyd going over your x-rays (if taken) and discussing your treatment plan. The second visit will consist of Dr. Floyd going over your x-rays (if taken) and discussing your treatment plan. Your treatment plan will encompass which therapy will be used and why, as well as how many visits it will take to reach your goals. Dr. Floyd will also discuss your insurance coverage and what your financial responsibility will be. After reviewing your treatment plan most patient elect to receive there first treatment. After your treatment is complete you will be escorted to our front desk where we will collect your co-pay and set up your next visit.